The cytomegalovirus (CMV) may not be a virus most people have heard of, but it is one of the leading causes of birth defects in the world. About one in 750 infants are born with a birth defect contributed to CMV. It is estimated that 50% of people have contracted the virus by the age of 20. That number leaps to 80% by age 80. Infection at birth is associated with brain damage and hearing loss. CMV has a unique way of hiding from immune detection, which has made creating a vaccine for the virus impossible, but researchers believe they have uncovered the hiding mechanism. Knowledge of how the virus hides in the human body is crucial to developing a vaccine; considered a high priority according to the National Institute of Medicine. CMV is a form of herpes. More well-known herpes viruses cause common conditions and illnesses including chicken pox, fever blisters (cold sores) and shingles. Though few parents know of CMV, more children are affected by the virus than affected by fetal alcohol syndrome or Down’s syndrome. The protein responsible for blocking the immune system from killing off the virus has been called UL141. What UL141 does not prevent is immune system reaction. The immune system attempts to kill off CMV constantly, which researchers believe leads to a wear-down of immune function over time. 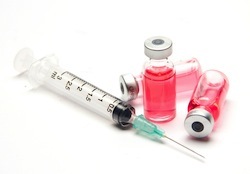 Hope of a CMV vaccine lays with the TRAIL death receptors 1 and 2. The death receptors should be able to kill off CMV, but UL141 stops them from doing so. If researchers can find a way to block UL141 function, the TRAIL death receptors could kill the virus and further health damage would be prevented. A vaccine against CMV is extremely important because many people with the virus never show signs of illness. Thus, they carry the virus and pass it on to others via urine, saliva and other bodily fluids. Treating the virus will not prevent future infection so a vaccine is required to stop CMV-related birth defects and health problems, and eliminate the virus for good. Source: La Jolla Institute for Allergy & Immunology. Researchers Advance Fight Against Leading Infectious Cause of Congenital Birth Defects. March 13, 2013.